40 pages; Dimensions 8.2 x 8.5 in. Engaging illustrations and simple rhymes display the many forms of courage from jumping off the diving board to protecting your little brother to changing bad habits. The moral of this heartwarming book, "Courage is what we give each other," promotes discussions and multiple instructional applications to current events. 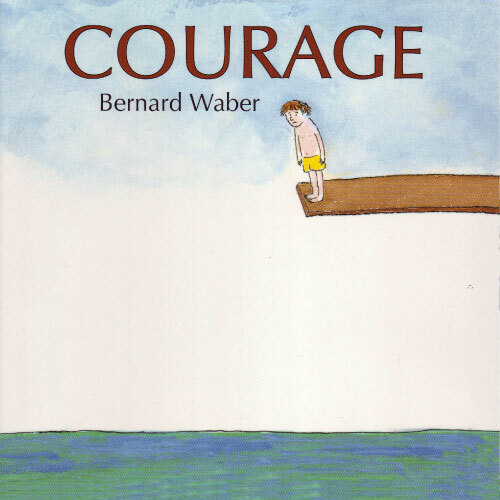 PreSchool-Grade 3-Focusing on a variety of scenarios, from the serious ("Courage is being the first to make up after an argument") to the more lighthearted ("Courage is tasting the vegetable before making a face"), Waber introduces children to the many ways to define this character trait. One or two statements appear on each page, accompanied by a whimsical pen-and-ink and watercolor illustration that offers an amusing interpretation of the captionlike text. Some examples seem to fit attributes other than courage more precisely ("Courage is two candy bars and saving one for tomorrow"), but children will certainly relate to most of them. A good read-aloud to spark conversation about what courage is and isn't, and the many forms it takes. Students discuss and write about the fears and phobias that a child at different ages may experience and what courage might look like in that situation. Encourage students to explore more than one age period to compare the similarities and differences. Bernard Waber, who has written eight delightful books about Lyle the Crocodile, a little boy named Ira, and a firefly named Torchy, is the author of more than seventeen picture books for children. Widely praised by reviewers for his ability to describe common family problems, he is best loved by children for his freeflowing humor and gentle characters.